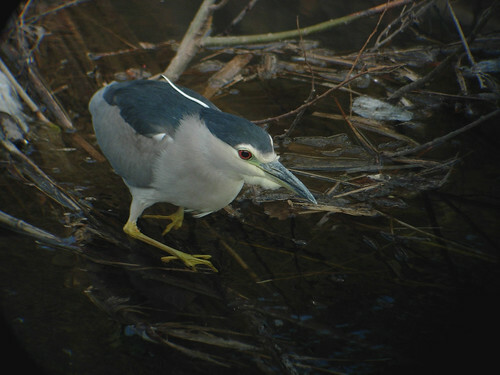 Black Crowned Night Heron near my flat. This was digiscoped with a 4MP compact camera handheld with a 50mm compact scope, good job the bird stayed so still. This individual ended up costing me a lot of money as this was the spur I needed to get my first DSLR. It hung around for several days and I got a 400D shortly afterward but by the time my crappy Sigma 70-300mm lens arrived the bird had gone. This is generally a summer visitor with the first birds arriving around this time. There isn't much vegetation for them to skulk in so it is one of the best times to watch them. The trees it was hunting from have now been cut down by Hakodate City Hall. For no apparent reason. Congratulations on a wonderful digiscoped shot. It's a challenging approach to bird photography. I'm sure you welcomed the 400D. Great shot, seeing how you got it. Handheld, wow. I must have a go one day. Congrats on this digiscpoed picture and for the new camera. The details of the picture are really sharp for a disgi! Thats great with digiscoping, must try it. More gear to carry.